The first Vanderbilt Cup Race, held in 1904, amounted to pandemonium according to press reports. Newspaper and poster promotion drew a huge crowd. Estimated to be as numerous as 50,000 spectators were lined dangerously close to the entire course, some actually straying onto it. There were so many people that they became part of the spectacle. The Vanderbilt Cup was the first contest of any real international stature held in the United States. Until then, major events took place in Europe and were dominated by cars made in Europe and driven mostly by Europeans. Because racing improves the breed, as they say, European cars were, with some exceptions, superior to those made in the United States. William K. Vanderbilt Jr. (1878-1944). 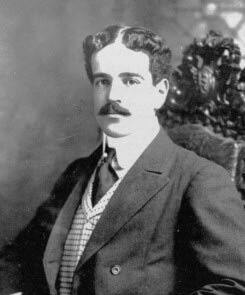 William K. Vanderbilt Jr., or Willie K as his friends called him, created the Vanderbilt Cup series. Willie K. was the great-grandson of Cornelius Vanderbilt, the railroad and shipping magnate. Vanderbilt Jr., a railroad executive and accomplished yachtsman, had spent some years participating in the fledgling sport of automobile racing. In Europe he was third in the 1902 Circuit des Ardennes in Belgium, was in the Gordon Bennett series and ran in city-to-city races including the infamous 1903 Paris-Madrid-Paris. He was impressed with the quality of European-made cars as well as European roads in comparison with those in the U.S. In order to encourage the improvement of U.S. cars and roads, he got the idea of promoting a series in America somewhat similar to the Gordon Bennett. 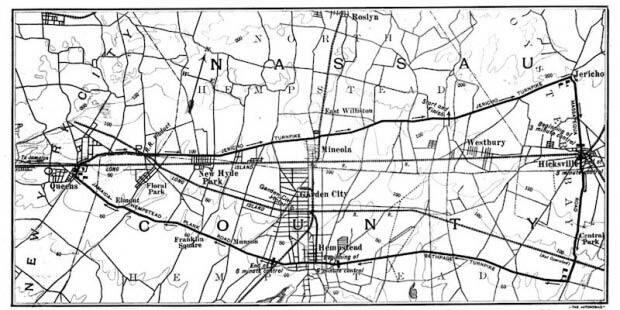 Initially, Vanderbilt’s proposal of an open road race on Long Island met with considerable resistance and controversy. There were a number of lawsuits and public hearings. Farmers objected because they used the roads to transport produce to market. Others, looking at experiences in Europe, thought it would be too dangerous. Nevertheless Vanderbilt, who had posted a large amount of prize money, eventually prevailed. The first race of the series took place over 30.24 miles of winding dirt roads in the center of Long Island. Like the Gordon Bennett, it was a competition among countries; entry was limited to five from each country. Cars had to be manufactured entirely within the country represented. A car had to weigh between 881 and 2,204 pounds. Everyone had to have a riding mechanic as well as the driver and each had to weigh at least 132 pounds. The course was roughly triangular and the race ran clockwise for ten laps. The Start-Finish line was at Westbury. The cars had to stop at Hicksville and Hempstead where they were inspected and then led by officials on bicycles through the towns and over railroad tracks. The race consisted of a total of 284.4 miles. Cars were sent off at two-minute intervals. Eight members of the Chronograph Club were on hand as timekeepers. Vanderbilt Jr. waved the first car off at 6 a.m. on Saturday, October 8, 1904. The 1904 Vanderbilt Cup was held on public roads in the Nassau County area of Long Island. As you can see, Mineola and Hempstead were in the center of the course with Hicksville at the right end. Eighteen entries had been accepted, but only seventeen made the start. They represented six cars made in France, five in Germany, two in Italy and five in the U.S. The French cars were three Panhards, a Renault, a De Dietrich and a Clement-Bayard, driven by Albert Clement Jr. himself. George Heath (born in the U.S, but a British citizen who lived in Paris) drove one of the Panhards. (It’s unclear why France was allowed six entries). The German cars were all Mercedes, all owned by Americans. Both Italian cars were Fiats. The five American entries were, with one exception, modified touring cars in contrast to the purpose-built European racers. The exception was the famous Packard Gray Wolf, an out-and-out racer. Other Americans included a Pope-Toledo, a Simplex, a White Steamer and a Royal, driven by Joe Tracy, the most famous American driver of the day. The American 75 bhp Simplex was owned and driven by Frank Crocker, son of Tammany Hall boss Richard Crocker. It was overweight at the weigh-in, so Crocker drilled many holes in the chassis. The American Pope-Toledo, driven by Herb Lytle, was a 24 bhp modified touring car.George Teste in a Panhard was first off. Paul Sartori in a Fiat was an hour and a half late, barreling through the Start-Finish at a high speed. After completing a lap, he was disqualified. He appealed and was allowed to proceed, but then retired with a failed clutch. On the first lap, George Arents Jr. rolled his Mercedes, killing his riding-mechanic, Carl Mensel. Also on the first lap, William Wallace’s Fiat had to stop for repairs. Finally, he drove off, forgetting his riding-mechanic, who ran and jumped on, fell off and was run over, injuring his leg. Whereupon Wallace picked up another required mechanic, but then stripped his gears and retired. Joe Tracy had a propeller-shaft shear-pin break on the first lap. So he went to a shop in Queens for repairs. Back on the second lap, he went out for good with a cracked cylinder and crankcase. Maurice Bernin’s Renault retired on the second lap with mechanical troubles. George Teste averaged a very rapid lap speed of 66 mph, but retired during the fourth lap when his ignition failed. The 30 bhp Packard Gray Wolf was a dirt-track car designed by its driver, Charles Schmidt. Schmidt and the Gray Wolf ended up in fourth place when the race was called. 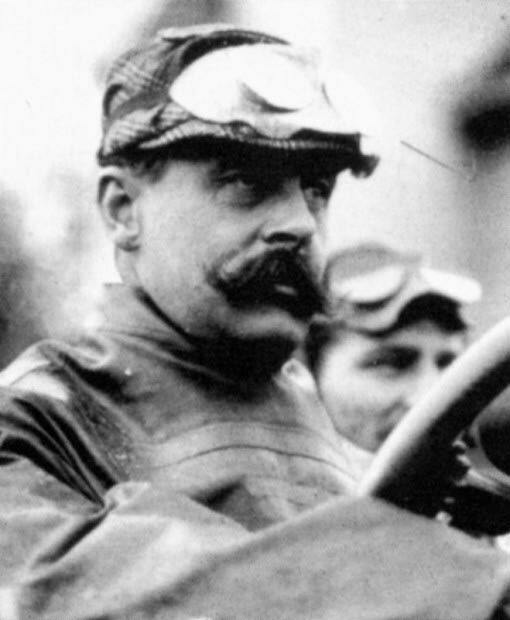 The race boiled down to a contest between George Heath in his Panhard and young 19-year-old Albert Clement in the Clement-Bayard. On the next to the last lap, Heath was only a little over a minute ahead. Worried that Clement might be able to pass, Heath sped up and won by one minute, 28 seconds, averaging 52.2 mph for the ten laps. After the race, Clement lodged a protest with referee Vanderbilt, claiming he was delayed at Hicksville and Hempstead. The Race Commission denied the protest and, after a late-night meeting, awarded the win to Heath. After the two leaders crossed the Start-Finish line, crowds of spectators rushed onto the course. So Vanderbilt stopped the race and notified the controls stationed around the course to stop the competitors. When the race was called, Herb Lytle’s Pope-Toledo was in third while five more cars were still racing. According to Motor Age, “Nassau County never saw such a day and will not again—until next year.” The American Mutoscope and Biograph Company produced a two-minute film, perhaps the first ever of a sporting event. The Vanderbilt Cup continued on various courses on Long Island through 1910 with a year off in 1907. 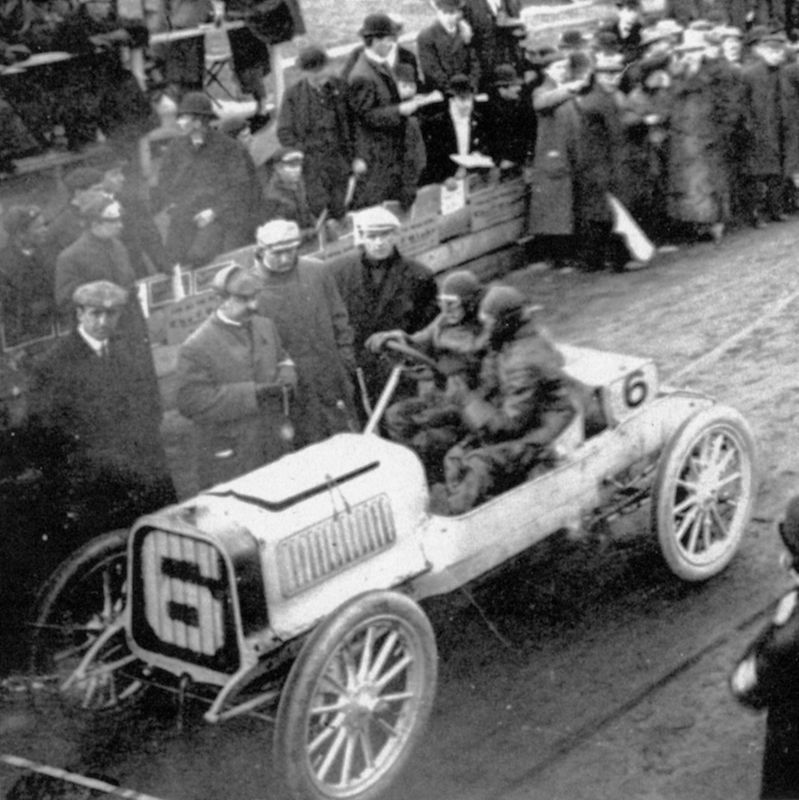 The 1905 event — run for 10 laps over a 23.5-mile circuit — was won by Victor Hémery in a Darracq. 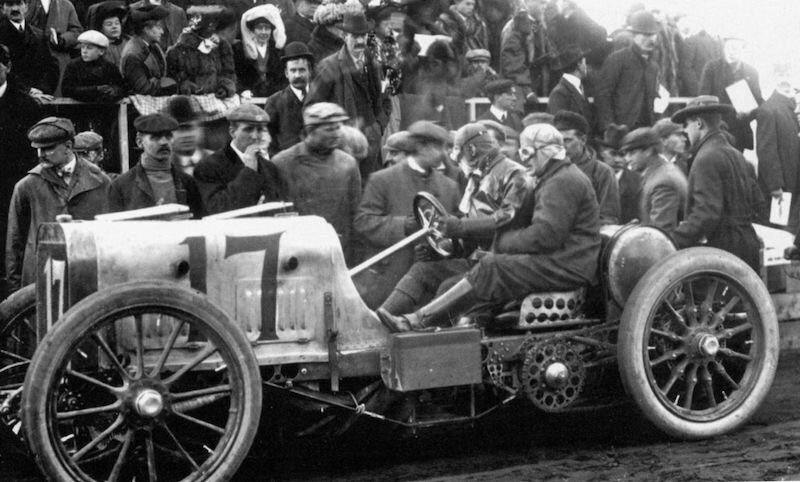 The French won again with a Darracq in 1906, piloted by Louis Wagner. That race was marred by the death of a spectator. The 1908 Vanderbilt Cup course incorporated the new Long Island Motor Parkway, the first paved throughway in the U.S. More than 200,000 spectators watched George Robertson win in a Locomobile. It was the first time a U.S.-built car had won, plus the first time for an American driver! The 1909 race for production cars was but a shadow of its former self. Although one of the very first stock car races, only 20,000 or so showed up to see Harry Grant win in an ALCO. The 1910 Cup had 30 entries plus 15 smaller cars. With lots of advance publicity, some 300,000 watched. Grant in the ALCO won again. From 1911 through 1916 — but skipping 1913 — Vanderbilt Cup races were held all over the country from Savannah to Milwaukee and out West at Santa Monica and San Francisco. None were held between 1917 and 1935. In 1936 at Roosevelt Raceway on Long Island, Tazio Nuvolari won in an Alfa Romeo 12C-36 entered by Scuderia Ferrari. The following year, Bernd Rosemeyer won in an Auto Union. None were held again until a Formula Junior event in 1960 was billed as the Vanderbilt Cup. Then from 1965 through 1968, CART races at Bridgehampton were called the Vanderbilt Cup. The Champ Car US 500 races from 1996 through 2007 were also called the Vanderbilt Cup. But then the Champ Car Series went broke and was purchased by Tony George, who has since indicated some interest in reviving the name. Really wonderful article supported by images, Art. One point about your closing. Tony George, while still part of the ownership family of the IndyCar series is no longer part of the management team and has little influence on day-to-day operations. That said, I do believe a revival of the Vanderbilt Cup in some form would be special. Howard Kroplick would know about the rights and the legal complications. It also requires a marketing strategy, of course, and all sanctioning bodies look for entitlement sponsorships associated with trophies/races/prizes. Again, congratulations on the great work Art.